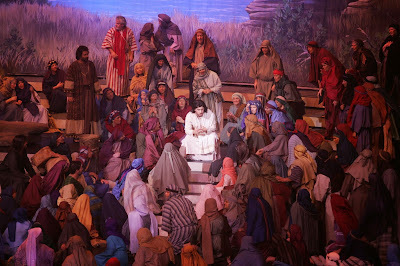 Jesus' great popularity on the heels of his healings and teaching brings out, along with the crowds, his family, prepared to act as the men in white coats. It seems they think Jesus is not quite all there—mentally deranged, crazy, "out of His mind"—and they're prepared to rescue Him from Himself. His successful exorcisms prompt another response from the scribes had Pharisees. They say, " 'He has Beelzebub. By the father of demons He casts out demons' " - Mark 3:22. Jesus ignores His family. He uses what the scribes and Pharisees say as a teachable moment for His disciples, alerting them to the gravity of crediting to Satan what is actually the work of the Holy Spirit. He calls it the unpardonable sin: " '… but he who blasphemes against the Holy Spirit never has forgiveness, but is subject to eternal condemnation' " - Mark 3:29. I've heard this same charge against the work of the Holy Spirit made by teachers these days. Perhaps you have too. Maybe we've made it ourselves about the works and ministries we don't understand, that go against how we feel the Holy Spirit works these days. Whether these thoughts and sentiments are unforgivable in others is entirely God's department to decide. But we must guard our own thoughts and attitudes, and be careful to avoid calling satanic the signs, wonders, and experiences attributed to the Holy Spirit that we don't understand, that don't fit with our (often faith-starved) theology. PRAYER: Dear God, lack of seeing the supernatural has affected my concept of what the normal Spirit-empowered Christian life should look like. Please open my eyes to the reality of Your power over nature and the spiritual realm. Amen.